Note: The Strip on Friday and Saturday nights, from around ten to after two in the morning, is gridlocked. But it's better now. For years kids from all over drove up and down the Strip in their fancy cars – everything from low-riders from East LA to young Asian guys from Monterey Park in new four-hundred thousand dollar Lamborghinis or "Rice Rockets" (tricked out Hondas or Subaru things and such), and teenage girls form suburban Orange County all dressed up and heavily plastered with odd make-up in the family SUV or pick-up truck trying to "be seen." Everyone blasted out the music they thought made a statement about who they are. And no one much stopped and patronized the restaurants or clubs, or shopped in the stores. 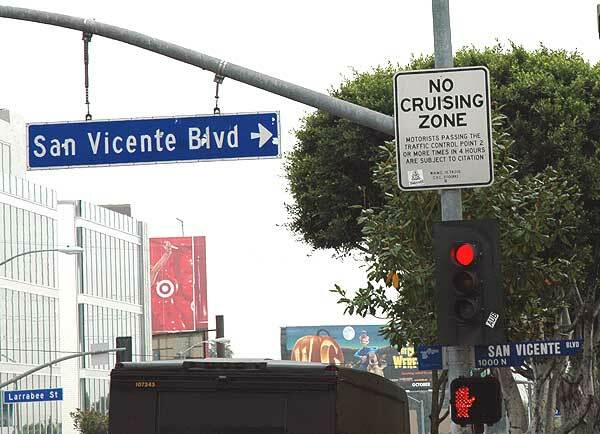 The local business asked the City of West Hollywood establish the strip as a "no cruising zone." This had worked pretty well up on Hollywood Boulevard a few years earlier. So now the Country Sheriffs (the City of West Hollywood doesn't have its own police department and contracts with them) parks a cruiser each of those nights every six blocks or so to make sure if anyone passes by more than two times in any four hour period they get a ticket. It helped a bit. Locals like me, if stopped, just show the address on the driver's license. We're exempt. 'No Cruising' - that's sick. There you are in America, the car heaven of the western world, and in Hollywood to boot! How can you have a sweet Dolce Vita on the Sunset Strip, where else can you show off those slick California cars, those golden Valley girls with their Berdo glitz, those chromed Harleys with the sleeveless tattoos, and of course the cops should be there too, in their heavy black and whites giving everybody the hard eyes? What would America say if they knew the blue fuzzbellies had the law laid down and were operating on total intolerance with 'no cruising' in Hollywood? Where, I ask you where, is the American dream? If it is not in Hollywood on Saturday night, where the hell is it? Cruising in France is not quite so common, because few kids have driver's licenses and fewer own cars. Kids who want to cruise bad enough will appropriate cars and if they can steer, it proves they can drive, good enough for cruising at least. "Locals like me, if stopped, just show the address on the driver's license. We're exempt." The true American dream - you have to live in Hollywood to have it and eat it too.